Blogging when done right can be a very lucrative pass time. In other words, you can make thousands of dollars simply sharing what you love. In this Workshop we provide an overview of the must haves you need to have the greatest possible Social Media exposure. And that means money. This Workshops objective is to allow you to discover and experience the power of Sharing what you Love. Your content strategy must therefore align with that topic that encourages your passion to flow. When you accomplish this you will attract a loyal niche audience. Content Marketing is a topic that if ignored will result in lost opportunities. That means money! Content Marketing is simply learning how to share, and if done correctly, will allow you to influence others to visit your blog and share what they learn to the people they know. This Workshop is about Social Media Marketing and Monetizing your Blog. Passion Pays. 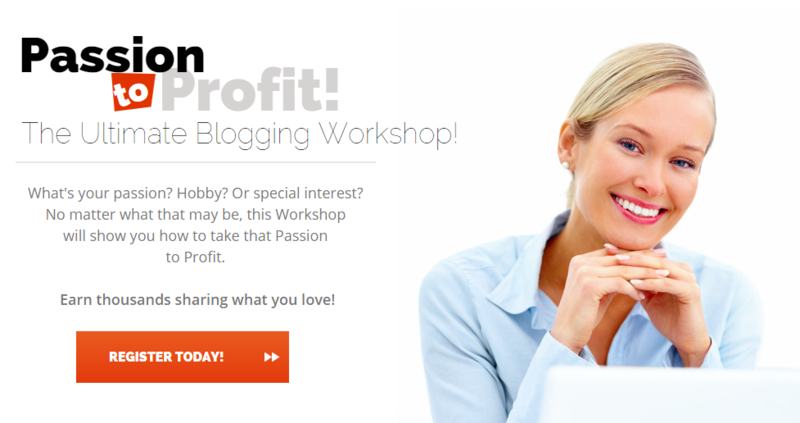 Passion to Profit, the Ultimate Blogging Workshop is offered to you for $97 and covers the major elements your blog and marketing plan needs in order to gain readership and improve your blogs potential. As you will discover your blogs reach will determine the level of passive income your blog can deliver. This 3 Part Workshop includes Workshop 1. 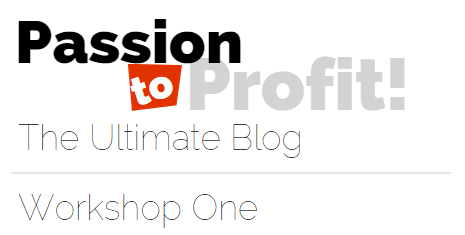 Passion to Profit | The Ultimate Blog Setup, Workshop 2. 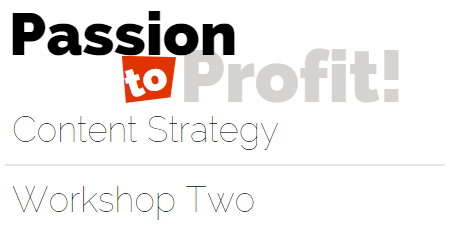 Passion & Persuasion | Content Strategy and Workshop 3 Passion & Profit | Monetizing Your Blog. Each session is a full One and a Half hours of Instruction. The Ultimate Blogging Workshop is located in our private members area which you will gain immediate access to once payment is confirmed. Take Your Passion to Profit. Register Here. Important Information for all Registered Users Please note once you have purchased the Workshop through PayPal you will be directed to register a free membership account at Curation Works the creators of Passion to Profit, the Ultimate Blogging Workshop. If you are already a member of Curation Works you will simply ignore this step. All accounts will be upgraded manually, so be patient. We will provide you private membership access where you will be able to access Workshop Replays 24/7, any time and anywhere. This is where you will access all workshop material and future helpful information and materials. The Ultimate Blogging Workshop. Register Now. Income statements and examples on this blog are not intended to represent or guarantee that everyone will achieve the same results. Each individual's success will be determined by his or her desire, dedication, marketing background, product, effort and motivation to work and follow a program. There is no guarantee you will duplicate the results stated here. You recognize any business endeavor has inherent risk for loss of capital. Materials in our products and our blog may contain information that includes or is based upon forward-looking statements within the meaning of the securities litigation reform act of 1995. Forward-looking statements give our expectations or forecasts of future events. You can identify these statements by the fact that they do not relate strictly to historical or current facts. They use words such as "anticipate," "estimate," "expect," "project," "intend," "plan," "believe," and other words and terms of similar meaning in connection with a description of potential earnings or financial performance. Unless otherwise noted, all products come with a minimum, unconditional 90 day guarantee. In other words, if you are dissatisfied for any reason, simply contact customer support and request a full refund of your purchase price (minus shipping and handling charges). Longer conditional guarantees may apply, so check the sales material at the time of your order for details. Copyright � 2015 Curation Works. All rights reserved.